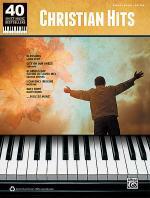 40 Sheet Music Bestsellers -- Christian Hits. (Piano/Vocal/Guitar). For Guitar; Keyboard; Piano; Voice. This edition: Piano/Vocal/Guitar. Book; P/V/C Mixed Folio; Piano/Vocal/Chords. 40 Sheet Music Bestsellers. Contemporary Christian; Sacred. 280 pages. Published by Alfred Music Publishing (AP.37633). ISBN 0739081853. Contemporary Christian; Sacred. 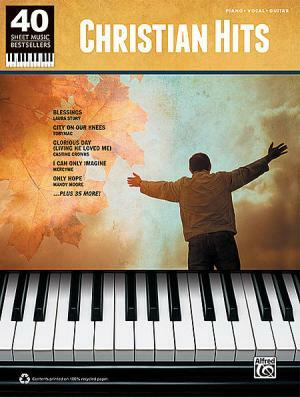 With immensely popular songs like "Blessings" (Laura Story), "Glorious Day (Living He Loved Me)" (Casting Crowns), "I Can Only Imagine" (MercyMe), plus 37 more, this collection of nearly 280 pages of sheet music is a must-have for pianists and singers. Due to their popularity and playability on piano, these songs rank among the top-selling sheet music titles in their genre. For practice, performance, and expression of faith through music, this collection guarantees unlimited hours of enjoyment. Titles: Amazing Grace (My Chains Are Gone) (Chris Tomlin) * Beautiful (Bethany Dillon) * Better Than a Hallelujah (Amy Grant) * Blessings (Laura Story) * Christ Is Risen (Matt Maher) * Cinderella (Steven Curtis Chapman) * City on Our Knees (TobyMac) * Cut (Plumb) * East to West (Casting Crowns) * Glorious Day (Living He Loved Me) (Casting Crowns) * Grace (Laura Story) * Hallelujah (Bethany Dillon) * Happy Day (Tim Hughes) * Held (Natalie Grant) * Hero (Skillet) * Hold On (TobyMac) * How Great Is Our God (Chris Tomlin) * I Can Only Imagine (MercyMe) * I Lift My Hands (Chris Tomlin) * I Refuse (Josh Wilson) * I Will Be Here (Steven Curtis Chapman) * I Will Rise (Chris Tomlin) * In Christ Alone (Newsboys) * In My Arms (Plumb) * Lead Me (Sanctus Real) * Let the Waters Rise (MIKESCHAIR) * Love Never Fails You (Brandon Heath) * Only Hope (Mandy Moore) * Perfect Peace (Laura Story) * Strong Enough (Matthew West) * Stronger (Mandisa) * The Way (Jeremy Camp) * When God Made You (Newsong) * When I Say I Do (Matthew West) * Wonder of the World (Rush of Fools) * You Are My King (Amazing Love) (Newsboys) * You Deliver Me (Selah) * You Raise Me Up (Selah) * Your Great Name (Natalie Grant) * Your Love Is a Song (Switchfoot).